Shows what you know, Superman! I'm not wearing any! But pink is a good guess. Peter: So, um, when you gonna cap that oil well? Superman: Peter, I'm very sorry, but we have no choice. 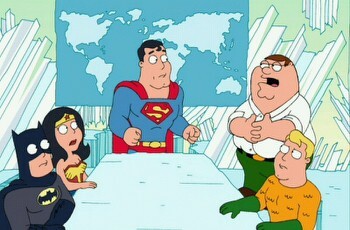 Stewie may be a baby, but he's a worse threat than Lex Luthor and Brainiac combined. We have to send him to the Phantom Zone! Peter: Stewie? Pfft! Forget about him! What you gonna do about Meg? Peter: Um, just to let you know, I couldn't find the bathroom, so I just went over one of those giant crevices. Hope that's cool. And with three votes...the hero who must say his good byes and leave the fortress......Aquaman. The tribe has spoken! I'm sorry but I can't use the john with that big ghostly head just watching! Peter: "C'mon just once, do that cellophane S thingy again." Peter: HA HA!! Told you I could fit into Aquaman's pants!! Peter: "Sorry, I was looking for the Fortress of Baileytude." Peter: Have you not heard? It was my understanding that everyone had heard.